Americans' support for legal marijuana has steadily grown over time. 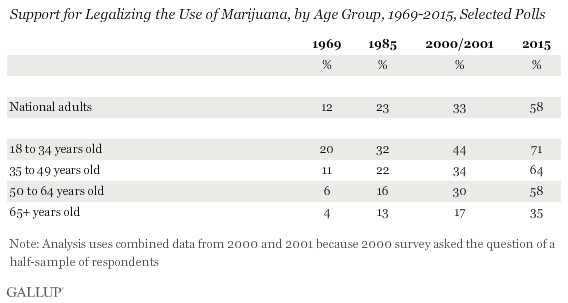 When Gallup first asked the question, in 1969, 12% of Americans thought marijuana use should be legal, with little change in two early 1970s polls. By the late 1970s, support had increased to about 25%, and held there through the mid-1990s. The percentage of Americans who favored making use of the drug legal exceeded 30% by 2000 and was higher than 40% by 2009. Over the past six years, support has vacillated a bit, but averaged 48% from 2010 through 2012 and has averaged above the majority level, 56%, since 2013. The higher level of support comes as many states and localities are changing, or considering changing, their laws on marijuana. So far, four states and the District of Columbia have made recreational use of marijuana legal, and Ohio voters are set to decide a ballot initiative that would do the same this coming Election Day. The topic has been an issue on the 2016 presidential campaign trail, and several candidates have expressed a willingness to let states set their own marijuana laws even though federal law prohibits marijuana use. Gallup has previously reported that two of the biggest differentiators of Americans' opinions on legal marijuana are age and party identification. Younger Americans, Democrats and independents are the most likely of major demographic and political groups to favor legalizing use of the drug, while Republicans and older Americans are least likely to do so. Younger Americans have always shown the most support of any age group for making marijuana legal, but this has grown from 20% of 18- to 34-year-olds in 1969 to 71% of those in the same age group today. But even older age groups today are more likely to favor legal marijuana than the comparable age groups in the past. For example, 35% of senior citizens today (aged 65 and older) are in favor of legalization, compared with 4% of senior citizens in 1969. Among all age groups, the increase in support has been proportionately greater over the last 15 years than it was between any of the earlier time periods. These patterns by age indicate that one reason Americans are more likely to support legal marijuana today than they were in the past is because newer generations of adults, who are much more inclined to favor use of the drug, are replacing older generations in the population who were much less inclined to want it to be legalized. But the increase in support nationwide is also a function of attitude change within generations of Americans over the course of their adult lifespans. 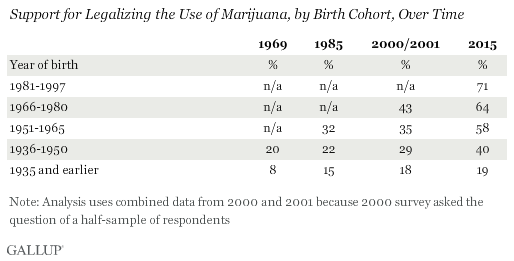 Gallup's historical data allow for a look at how views on marijuana legalization have changed over time among independent samples of those in the same birth cohorts. For example, Americans who are aged 65 through 79 today -- born between 1936 and 1950 -- are more supportive of making marijuana legal in 2015 than those born in the same years were 15, 30 and 46 years ago. This birth cohort's support has increased from 20% in 1969 to 29% in 2000/2001, and is 40% today. Americans born from 1951 through 1965 and from 1966 through 1980 are also more likely to favor legalizing marijuana than they were 15 years ago, with support growing a little more than 20 percentage points within each of these birth cohorts over that time. That exceeds the increases in support for older birth cohorts over the same time. The oldest Americans, those born in 1935 or earlier, have shown far less change in their attitudes about marijuana over their life spans. The near-doubling of support between 1969 and 1985, from 8% to 15%, reflects the dying off of the oldest Americans in that birth cohort during that time period as much as it does attitude change among those from that birth cohort who were still living. Americans' support for legalizing marijuana is the highest Gallup has measured to date, at 58%. Given the patterns of support by age, that percentage should continue to grow in the future. Younger generations of Americans have been increasingly likely to favor legal use of marijuana as they entered adulthood compared with older generations of Americans when they were the same age decades ago. Now, more than seven in 10 of today's young adults support legalization. But Americans today -- particularly those between 35 and 64 -- are more supportive of legal marijuana than members of their same birth cohort were in the past. Now senior citizens are alone among age groups in opposing pot legalization. These trends suggest that state and local governments may come under increasing pressure to ease restrictions on marijuana use, if not go even further like the states of Colorado, Oregon, Washington and Alaska in making recreational marijuana use completely legal. 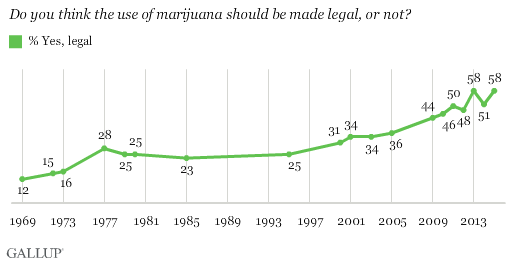 A majority of Americans support legalizing marijuana for the first time in Gallup's trend dating back to 1969. Republicans and older Americans still oppose legalization, but most young adults, Democrats, and independents favor it.